The revised and updated second edition of Introduction to Cities explores why cities are such a vital part of the human experience and how they shape our everyday lives. 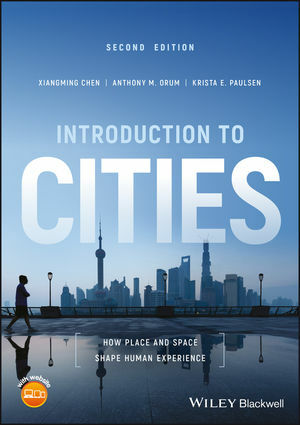 Written in engaging and accessible terms, Introduction to Cities examines the study of cities through two central concepts: that cities are places, where people live, form communities, and establish their own identities, and that they are spaces, such as the inner city and the suburb, that offer a way to configure and shape the material world and natural environment. Introduction to Cities covers the theory of cities from an historical perspective right through to the most recent theoretical developments. The authors offer a balanced account of life in cities and explore both positive and negative themes. In addition, the text takes a global approach, with examples ranging from Berlin and Chicago to Shanghai and Mumbai. The book is extensively illustrated with updated maps, charts, tables, and photographs. This new edition also includes a new section on urban planning as well as new chapters on cities as contested spaces, exploring power and politics in an urban context. It contains; information on the status of poor and marginalized groups and the impact of neoliberal policies; material on gender and sexuality; and presents a greater range of geographies with more attention to European, Latin American, and African cities. Revised and updated, Introduction to Cities provides a complete introduction to the history, evolution, and future of our modern cities. Xiangming Chen is the founding Dean and Director of the Center for Urban and Global Studies and Paul Raether Distinguished Professor of Global Urban Studies and Sociology at Trinity College, Hartford, and a guest professor in the School of Social Development and Public Policy at Fudan University, Shanghai, China. Anthony M. Orum is Professor Emeritus of Sociology at the University of Illinois at Chicago, USA. He was the founding editor of the journal City & Community. Krista E. Paulsen is Associate Professor of Sociology and Associate Dean of the College of Arts and Sciences at the University of North Florida, USA.